Pest control is the management or regulation of pests that are perceived as harmful to the ecology, a person’s health or the economy. There are several types of pest control, depending on the pest in question. In suburban areas, termites are some of the major pests that wreak havoc on everyday life and cause major destruction to property. Annually, they damage property worth approximately $50 billion and are found in 49 of the 50 states. Alaska is the exception. People should, therefore, be able to inspect their premises and implement pest control measures whenever they are found. Detecting the presence of termites early on will save you a lot of money and trouble in the long run. You can inspect for termites on your own, or call in a professional to do it for you. It is easier and better to get a professional involved because they will know exactly what to look for since termites work from the inside out, and one may not be aware of their existence until it is too late. An annual termite inspection is enough to help you keep track of any termite invasions. What then should you look for when inspecting for termites? You should look for evidence of swarmers. There are three major types of termites found in the USA, but the subterranean termite is the most common. You should look for colonies of termites. Given that they are winged creatures, you should be careful not to confuse them with winged ants. You should also look for the presence of mud tubes, which are located along the foundation, near pipes, crawlspaces, the attic and other access points to the home. If you see mud tubes and want to confirm if you have a current infestation, or if it is from an old infestation, break both ends of the mud tube and leave them for a few days. If they are sealed back up in a couple of days, you have an active termite infestation in your property. If there is mud in construction joints, this is also indicative of termite infestation. Termites are known to seal small gaps in order to make themselves comfortable. You should also check for wooden areas in and on your property that can harbor termites such as wood fencing adjacent to your house, wood mulch within 4-6 inches of your home’s foundation, firewood, deadwood and other wooden structures. The best evidence of termites is wood damage because termites eat wood from the inside before surface damage is seen. To terminate termites from your property, you can either enlist the help of a professional pest control company, or do it yourself. 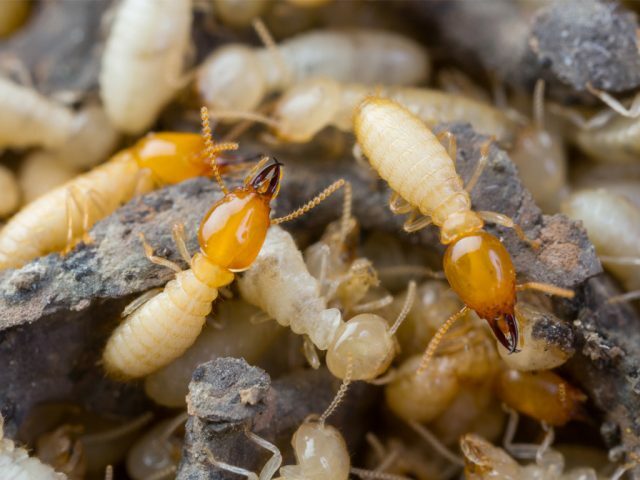 The two major methods for termite control are using termite baits or using liquid termite insecticides (termiticides) for soil or barrier treatment. Barrier termite treatments are used to prevent termites from entering a structure. They can also stop termites inside a structure from getting to soil where termites get moisture to survive. Liquid termite control gives faster results because the liquid can be applied close to the termite infestation. If you choose to use termite repellents, termites will find a way around them. Termites can, however, not detect non-repellents such as Taurus SC and Termidor SC. The former is more economical compared to the latter. Chemical barrier pesticides are short lived since they provide protection for only 5-8 years. There are various termite baiting systems in the market today. Baits can be placed directly on the ground or around the outside of a structure. When termites come into contact with the bait, they will feed on it and die. An example of such bait is Trelona ATBS termite bait system. Baits can also be used as a monitoring tool for detecting termite where they are not yet a problem. These baits also work well where the given structure is untreatable with soil termiticides such as near a body of water, where there is a concern about pesticide use and where soil treatments have failed.